Compuverde provides a revolutionary, energy-efficient and globally patented unified storage solution with NAS (SMB/NFS), SAN (iSCSI) and Object Store (S3/Swift/Cinder) in one package. Fully software-defined, completely hardware-agnostic and massively scalable, eliminating the cost and worry of future data migrations and hardware replacements. Compuverde Hyperscale vNAS creates a storage cluster out of bare metal servers. Each node in the cluster is a self-sustained server, each with the same functionality and responsibility which makes it robust and highly scalable. 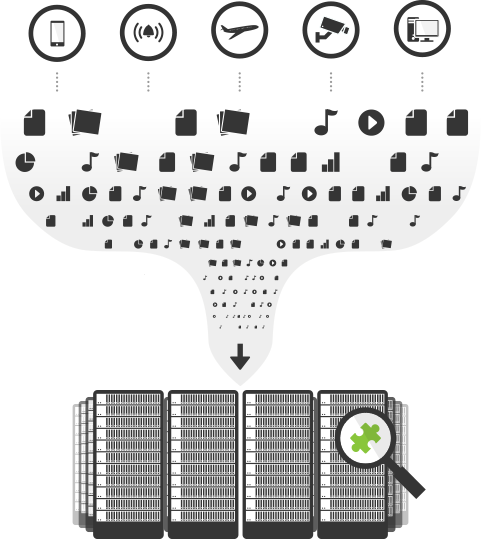 The file system spans over all servers in the storage cluster, consistently available through any server and through any of the available protocols. This makes for a storage system that is flexible and easy to scale and manage. Compuverde supports today's as well as tomorrow's storage needs by providing a software-defined and horizontally aligned storage platform. A platform that is both completely hardware agnostic and fully flash compliant - meaning you don't need to look any further - the Compuverde web-scale architecture enables the kind of flexibility that is critical to the future of the storage business and the rise of the Internet of Things. Global by demand, Swedish by design, Compuverde is the perfect storage example of the clean, well-structured and innovative heritage our Swedish origin represents. With a solution that delivers cutting-edge technology combined with industry-leading performance and redundancy - all with best-in-class total cost of ownership.